“Scene de menage”: def – A domestic conflict, colloquial equivalent of a “dust up”. I have always found this common french expression for a household fight very a propos. Particularly as the word “menage” means “housework” i.e. “Je deteste faire le menage” equals “I hate doing housework”. And in our household the “scenes de menage” are almost always just that. Franck and I don’t fight about money, we don’t fight about how we raise our kids, but man-oh-man is housework every a trigger for us (well, OK, more for me if truth be told). I don’t mind doing the dishes, I don’t mind ironing, I don’t mind folding clothes, but as far as vacuuming, spraying, and getting on my hands and knees to scrub out the bathtub and the toilet, I REALLY have Issues (and yes, that capital “I” is 100% intentional). Tragically, however, the housework does not go away while I am engaged in all these industrious activities. Instead, the task gets bigger, and more horrendous, and my resentment at having to do it grows accordingly. Here is one of the aspects of myself that I am not very proud of – inevitably by the time I finally capitulate and drag out the vacuum, Windex, and toilet brush I am in a black mood and hate the entire world and everybody in it, especially my loved ones who helped make the mess. I holler, I bellow, I yell at anyone who dares get in my path. I become a total shrew for the entire time the housecleaning lasts, and sometimes for a good couple of hours afterwards. 1. Dirty house seems like such an overwhelming task. Feel tired, hopeless, and discouraged (not to mention mad) before I even begin. 2. Know from past experience that hard work will be undone in anywhere from a few hours to two days, tops, and this stirs up unspeakable resentment. 3. Feel like I work my proverbial rear end off during the week at my job, caring for the kids, etc. and strongly resent having this other and very much unwanted job of housework. It’s like unpaid overtime. 4. Dirty, unrenovated home makes me feel like a failure. Why is it we are still camping in our mid to late 30’s? In the book “Simple Abundance” the author says there is a direct correlation between self esteem and the comfort of one’s home. This terrifying thought catapults me back to the couch of that German psychoanalyst whom I frankly don’t want to be spending my precious time with. OK, yes, it has occurred to me that I am perhaps just a spoiled brat, or that maybe the problem is that I just can’t get over myself. It’s true that I was brought up in a social and educational environment where us girls were being groomed for stellar careers and Great Things – cleaning the toilet was definitely not alluded to in any way, shape, or form. This cold, hard reality came as quite a shock to me, and I would bet I wasn’t the only one. And yet the toilet must be cleaned…why not just get a house cleaner? many of my friends have asked when I describe the scale of my housecleaning angst. I could, and I think I will, but cleaning this half-renovated house seems like a bit of rotten job for any house cleaner. Besides if we ever receive the permission to cut out the hole for our new french doors (no, still hasn’t arrived yet,and we’re going on four months now) we’ll be starting our Reno’s in September. It really doesn’t seem fair to subject any other person to cleaning out piles of drywall dust, Reno refuse, etc.. However, when my house is done, then, yes, I very well might hire someone. In the meantime however, I have new hope. 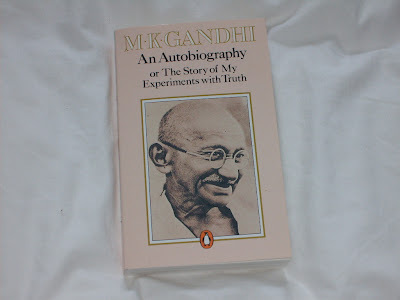 My dear friend Heather who lives in Germany (see her blog here http://www.unlikelynomad.blogspot.com/ ) told me that what I needed to do was read Gandhi’s biography, as this changed her view on housework and showed her how important, meditative, and restorative house work could be if you just looked at it the right way. She said she would send me the book. Franck overheard this, and could barely conceal his joy. Two weeks later a book arrived in the mail and Franck exclaimed with glee “That must be your Gandhi book about housecleaning!”. I opened it up to find, much to my delight and Franck’s despair, Anne Lamott’s fabulous book about writing “Bird by Bird” instead. Franck was gutted, I was overjoyed, and I wrote Heather to tell her she had made a fine choice. Two weeks later, however, I received another book in the mail and this time it was my Gandhi / housecleaning salvation book from Heather. So far it’s been very interesting, but I haven’t got to the part about the zen of housecleaning yet. However, when I do I’ll be sure to let you know if there has been our own little french revolution here Chez Germain, and whether there has been any significant reduction of our weekly scenes de menage. My hopes (not to mention Franck’s) are all pinned on Gandhi. This entry was posted in Favorite Posts on July 3, 2007 by admin.